The construction of a public building is an opportunity to add value far beyond the utility of the building itself or the temporary jobs needed to construct it. Understanding how the form and location of a public building adds value to a community is a key component of Strong Towns thinking. It is a knowledge we once had as a people that we desperately need to recapture. We would like to thank James Segedy of Pittsburg, PA, for his ongoing support of Strong Towns. It is the support of people like James that is giving us the resources and credibility to grow the Strong Towns movement. If you value what we do here, please consider becoming a supporter of Strong Towns today. This post is another in our Brainerd/Baxter Strong Town series. In this series we use my twin hometowns of Brainerd and Baxter as convenient laboratories for applied Strong Towns thinking. I say "convenient" because I live here and can easily gather photos and data but also because I grew up here and know the story behind many of the streets, neighborhoods and landmarks. You can read more from this series here. A Strong Town utilizes a system of interconnected parks and civic structures to provide value to property owners within the community. Parks, greens, squares and civic buildings provide value when they enhance the public realm, create memorable landscapes and provide for spontaneous gatherings. There are two important things to note about that photo. First, look at how the architecture used in the design says something important about the building. Nobody is going to mistake this building for a retail establishment or an office complex. The classical, Greco Roman architecture clearly conveys the use of the building -- government -- in a manner consistent with our style of government, that being Greco Roman (a republican democracy). This building makes a powerful statement about who we are as a people; as Americans as well as citizens of Brainerd and Crow Wing County. The second thing to note is where the building is located. Our ancestors chose to locate this monumental structure at the termination of a street. This was done intentionally and not because they got a good deal on the land. The location was chosen because placing this structure here projected its "value" far beyond the immediate vicinity. When our ancestors built this structure, they were pooling their limited resources to build a monument that would last generations and, in a stroke of subtle brilliance, added to the overall return by reflecting value onto all of the others structures whose view it enhanced. Consider the following photo taken nine blocks away from the courthouse. You can see it there in the distance at the end of the street. Every property owner along this street -- which extends for blocks and blocks -- enjoys, as part of their daily routine, a public realm that includes this fantastic building. In an era where we built places for people instead of cars, this is how we maximized our return on investment. Crow Wing County recently built a new courthouse and related offices on an adjacent property. The following picture is that building as viewed from the front of the old courthouse. Of course, the architecture is completely out of place for an historic downtown. Besides confusion and desolation, it communicates "suburban", especially with the way they located the huge parking lot in the most prominent part of the property. The City of Brainerd has hardly improved things with the "decorative" lights. They are better than the cobra lights found elsewhere in the city, but still vastly out of scale for human activity sans automobile. The one feature of the property that got a huge amount of publicity (because everyone was seemingly so proud) is the weed garden in front for "natural" stormwater infiltration. This is a compulsion we have developed to soothe our anxiety. Whenever we build something hideous, we try to make up for it by importing nature. Like the campus itself, the weed garden just looks out of place in the downtown core of the city. Unfortunately, the new courthouse also terminates a critical vista, that being along Front Street. Consistent with the overall design that cares little about its place in the city or how it reflects on any of its neighbors, here is how that view is terminated. Yes, that is a brick wall with a loading dock. How tragic. I almost cried when I saw this being built. The design process had not been a real public affair and the only thing the city of Brainerd seemed concerned about at the time was the potential for lost tax base and the noise from the air conditioner that bothered one of the council members that lived nearby. We've wasted a once-a-century opportunity to leverage a $50+ million public investment to make the community better. Instead, we got a building that is functional, but leverages none of the investment for improving the public realm and creating value in the surrounding neighborhoods. The arrows in the aerial shot below (thank you, Google Earth) show the streets that frame each of these views. 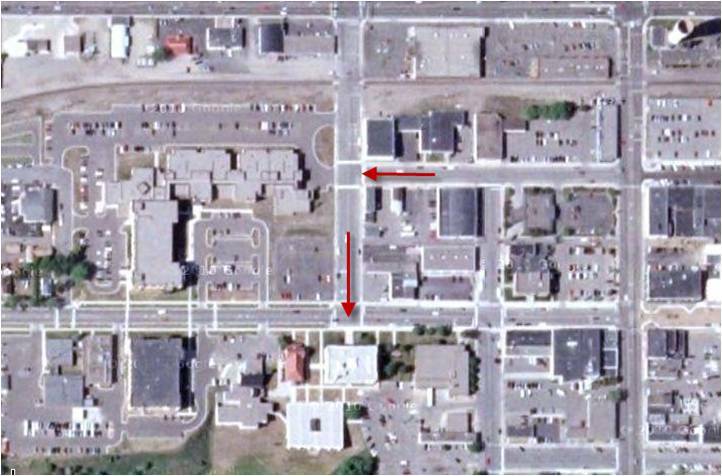 The north/south arrow runs to the old courthouse and the east/west arrow to the new. I encourage all of my local critics to pile on with criticism and defend this building. It created jobs. It kept jobs in the downtown. It made the county operate more efficiently. Yada, yada, yada.... These arguments miss the point. We could have had all of that AND dramatically improved the public realm of downtown Brainerd -- our largest and most important city - for the next century or longer. For the same price but with a different orientation and configuration, we could have built a building that made every property near it more valuable due solely to its presence. Leveraging public investments for a much greater return - that is what a Strong Town would do. We could have built a building that said something about who we are as people, what our civic values are and how we choose to honor those who came before us as well as those that will come after us. My greatest lament with this building came when I realized that we had. We continue to receive requests from communities looking to host a Curbside Chat. We're trying to reach you all. If you are interested in supporting our Curbside Chat program or our efforts to create a Chat video for broad distribution, please consider a donation to Strong Towns. We are slowly working our way down and now need to find just 87 people willing to make a modest, $25 donation towards the video project. Thank you for your support.